Ask how you can waive the site fee! Beneath the old Calaveras County courthouse, the old Calaveras County jail is a beautiful space perfect for receptions, wine tastings, and other events. Renovated in 2012 by Hotel Impossible, host Anthony Melchiorri called this a "room of endless possibilities," and that description perfectly describes the space. 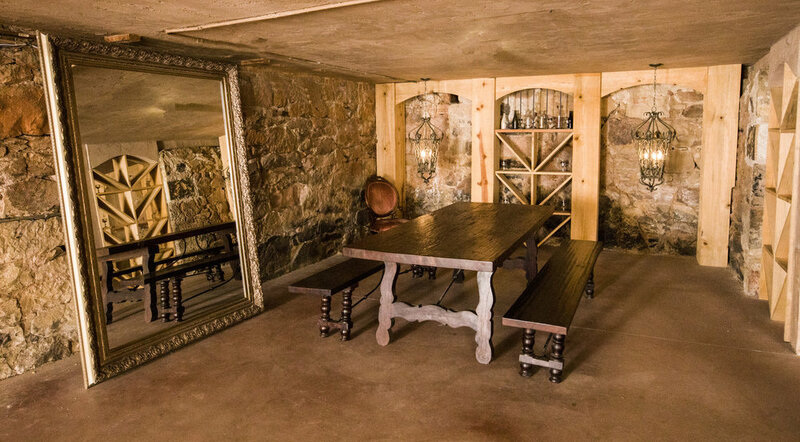 Located in the former tunnel system beneath town, this spooky space is a unique setting for events ranging from private dinners to birthday parties to bridal showers. Formerly the Calaveras County Courthouse and later a theater, the Hotel Léger's banquet room is perfect for events ranging from weddings and birthday parties to seminars and workshops. Underneath over 200 year old orange trees, the courtyard is a beautiful location for summer weddings. Featuring a large blue pool and a bar set-up, it's a great space for pool parties, birthdays, and receptions. Ask how you can receive a discount on the site fee!